the extraordinary decorative treatment. 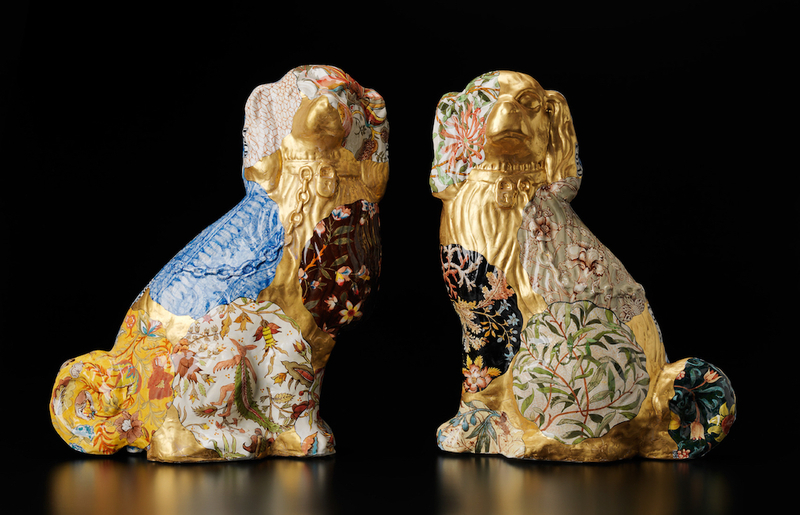 They are lavishly gilded and overlaid with a complex arrangement of circular patterns, several of them recognisable Morris furnishing designs, as well as late eighteenth-century Napoleonic French fabric and toile designs. Typically, there is a quiet subtext to all this lavish design work. It is no accident these mantle-piece forms are covered with wallpaper and home furnishing designs. Bowers is obliquely commentating on patterns- in-nature and how nature is appropriated and consumed in patterns, which, in turn, condition and reflect our relationships to, and expectations of, the natural world. Studying how the different types of decoration and patterns interact and flow over the three- dimensional modelled surface is fascinating. Bowers’ use of Morris design is suggestive. Regardless of their general appeal and clear homage to one of the greatest pattern designers of all time, there is a direct and important local connection. Bowers lives in Adelaide, and the Art Gallery of South Australia holds one of the world’s nest collections of Morris & Company furnishings, most of it a legacy from late nineteenth-century Adelaide interiors.